The markets have gone absolutely nowhere this week, and millions of investors are convinced there’s “nothing to buy,” so they’re thinking about selling. I can’t think of a more expensive mistake. Hedging your bets is a far more profitable alternative. A cautionary tale, the expression highlights the dangers associated with trying to second-guess market conditions. Plainly put, it’s also a warning against “looking for action” when there isn’t any. 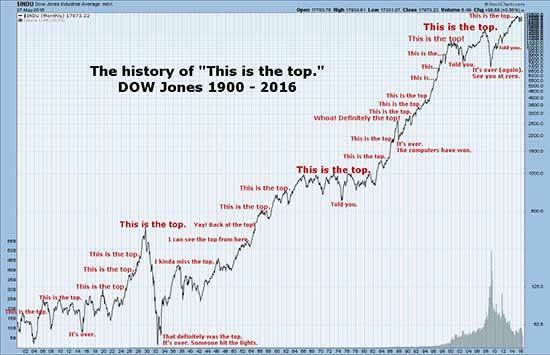 This isn’t new thinking, contrary to what many investors believe. In fact, Aristotle wrote about the comparison of anticipated consequences versus current conditions nearly 2,500 years ago, as a source of stimulus. He observed that we gravitate towards those things that give us pleasure, and move away from those that don’t or might not. The interesting part is that we guess based on what might happen rather than what is happening. I joke about this all the time with audiences around the world, but the data surrounding loss aversion is very real. Social scientists, for example, have shown that we’d rather eliminate all risk than simply reduce it – from 2% to 0% versus 90% to 2% even if there is a guaranteed return involved. That was the case in late 2008 and into 2009, when many investors were convinced the end of the financial universe was upon us. They foolishly went to cash or bonds instead of buying into the world’s best companies at huge discounts like I advocated at the time. Since then, the S&P 500 has tacked on a staggering 332.47% which means every $10,000 invested is now worth $43,247.00. It’s also been the case since December 24, 2018, when the markets dropped by 11.32% in only eight days, only to spike 6.76% higher during the first trading day of this year. Many folks told themselves that they’d “wait for a pullback” or buy on “a dip” but that never happened. The markets have now enjoyed the best start to any new year since 1998. The FANG stocks alone – Facebook Inc. (NasdaqGS:FB), Amazon.com Inc. (NasdaqGS:AMZN), Apple Inc. (NasdaqGS:AAPL), Netflix Inc. (NasdaqGS:NFLX), and Google’s parent company, Alphabet Inc. (NasdaqGS:GOOGL) – have tacked on $600 billion all by themselves. This is the part of investing that Wall Street will never tell you about. It’s scary, but absolutely essential when it comes to big profits. Today’s markets don’t allow for huge pullbacks. There will never be a sign saying “buy now,” or that a certain stock is “on sale.” Waiting to buy can mean the difference between retiring early or working late into your golden years. Stocks that are market leaders go up for a reason. What’s more, they can go up for months, years, even decades. Stocks that are “expensive now” – like Apple, Amazon, Alphabet, for example – were all bargains at one point in time. Apple Inc. (NasdaqGS:AAPL) was only $98.83 a share in June 2016, when I told you that the company would move beyond iPhones and make a critical pivot into medical devices that the markets are just now beginning to recognize. It’s trading at $200.28 today. Amazon.com Inc. (NasdaqGS:AMZN) was just $965.90 a share in September 2017 when I urged you to get on board as a way to capture the company’s retail dominance AND the move into big data services. It’s trading at $1,847 today. Alphabet Inc. (NasdaqGS:GOOG) was merely $788.48 a share in September 2017 when I voiced my opinion that it would move beyond search to specialized businesses in machine intelligence, medical tech, and more. It’s trading at $1,210.91 today. My point is not that I was correct – I make plenty of mistakes. What I am trying to illustrate is that you pick your entries, and you buy, even if you fear the consequences associated with downturn ahead. Pessimists almost never make money. Optimists, on the other hand, do. By staying “in to win” – an expression you hear me say quite often. Hedging – instead of selling outright – is how you do that, when faced with the prospect of a downturn like the markets are today ahead of what is widely expected to be a rough earnings season. Studies show that having 2% to 5% of your total portfolio in hedged holdings can take the sting out of a market reversal by creating some zig when everything else zags. I’ve recommended the Rydex Inverse S&P 500 Strategy Fund (RYURX) and its ETF equivalent, the ProShares Short S&P 500 (SH) for years. Both appreciate as the S&P 500 drops, which means you can sleep well at night knowing that your favorite stock positions aren’t going to get taken to the cleaners, even if the broader stock markets do. Incidentally, I’d stay away from the so-called “leveraged” inverse funds, promising double or triple the appreciation of a corresponding decline because of something called tracking error – meaning how they reflect the underlying indices they track – and the leverage needed to supercharge ’em. If you’re options savvy, consider buying puts on the indices needed to protect your portfolio. Presumably that includes the S&P 500, probably some tech and even bonds, too. More sophisticated alternatives could also include selling spreads or buying diagonals. Or, you could simply invest a portion of your portfolio in a hedged strategy like the Franklin Templeton K2 Alternative Strategies Fund (FAAAX). It’s expensive in terms of fees – the front load is 5.50% and ongoing expenses are 2.61% – but the longer term stability it offers skittish investors is terrific. Case in point, the fund’s three-month Beta is just 0.51 which means the volatility is about half of that of the broader markets according to YahooFinance! At the same time, the fund has a low minimum investment of $1,000 according to Morningstar, and $1.2 billion in assets that give it staying power. Top holdings include a blend of technology, industrials, healthcare and even consumer cyclicals. In closing, here’s my advice. Hedging is not about trying to second-guess the unguessable. Rather, it’s about managing the risk associated with the unknown. So you can stay in the game and on track for the big profits you deserve. Even if this earnings season stinks.